Bowling is enjoying ever greater popularity. However, the floor space and administration required for a classical bowling alley often pose a problem for proprietors of small-scale recreational venues. Mini-bowling is the same as conventional bowling but on a smaller scale. It only requires about 40% of the space and is played with a correspondingly sized ball (140mm) and smaller pins. 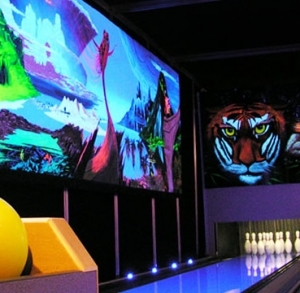 They can incorporate all the familiar features of classical bowling (scoring systems, games and graphics, “glow in the dark” effects, running lights, bumpers, masking units, etc.). Mini-bowling has universal appeal giving pleasure to children their parents and grandparents – fun for all the family. Mini lanes are virtually maintenance free with a daily static mop of the lane surfaces, cleaning of the run up area, and emptying of the coin boxes (if installed) required. A weekly check of the machinery and quick clean is recommended. Depending on the level of utilisation a check of the pins and strings is required monthly for very high usage and quarterly for medium to high usage. Mini Lanes can deliver a return on investment in less than one year.